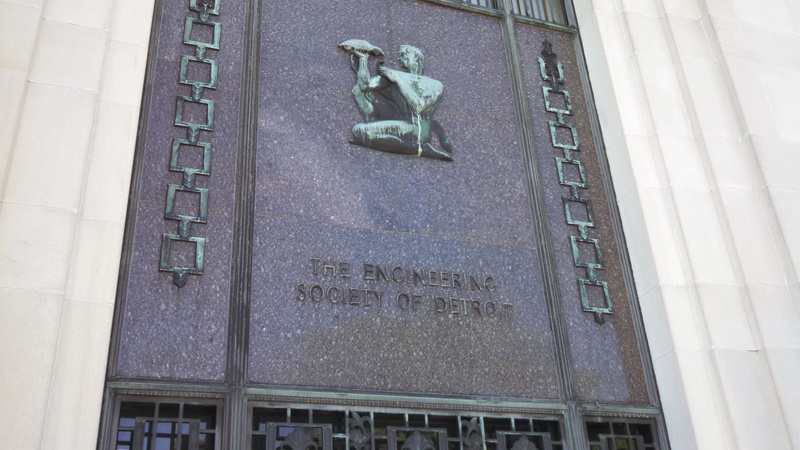 DETROIT — The Engineering Society of Detroit enjoyed many happy decades at the Horace H. Rackam Education Memorial Building, better known as just the Rackham Building, in midtown Detroit. Friday, I got a look behind the scenes at this magnificent 1940 Art Deco structure. At times, it felt a little like archaeology. But these aren’t ruins. This building not only has great bones, as they like to say about many a Detroit building rehab — here, most of the flesh and muscle are intact. Most of this building looks to need only scrubbing up, and some superficial renovation like paint and carpet and plaster. And I’m happy to report that pretty soon, the ESD will be returning to its roots, offering some activities at the Rackham Building. The Rackham Building is co-owned by the Rackham Engineering Foundation, set up by Horace and Mary Rackham to support ESD, and the University of Michigan. Today, Wayne State University occupies a chunk of the building for some of its programs in speech and hearing. Included is an absolutely stunning two-story-tall library over the main Rackham Building entrance. Fully renovated, it’s just spectacular. But much of the building has been left vacant. There are the former ESD headquarters office, which we left in 1994 — and which, until this past winter, were occupied by the Detroit Area Pre-College Engineering Program. And there are several beautiful meeting rooms, some of which have been partially restored thanks to a generous gift from ESD’s College of Fellows. But there’s much more than that. A bunch of us from ESD explored not just one, but two beautiful auditoriums — one, an intimate performance space seating around 400, and another, much larger space seating about 1,000. Both feature drop-dead gorgeous Art Deco touches. You’d swear the Wizard of Oz was just around the corner. I’ve seen a lot of great things happen in downtown and midtown Detroit since I moved here in the early 1990s. A lot of buildings that could have been left for dead have been brought back to life. Most of them were in a whole lot worse shape than the Rackham Building. This one isn’t far gone. Under a little dust could be a spectacular new home for engineering and technology in the heart of Detroit. And now, about the Rackhams? Well, according to his official University of Michigan biography, Horace H. Rackham was born on a Macomb County farm in 1858 to a retired English sea captain and his devout wife, and was educated in a one-room schoolhouse. As a young man he worked at a variety of jobs in Detroit and studied law at night. In 1894 he opened a law firm. There was little exceptional about Rackham’s life or law practice — except his neighbor happened to be Henry Ford. When Ford decided to incorporate his fledgling automotive company in 1903, he engaged Rackham to draw up the required papers. Having no money with which to pay his lawyer, Ford instead convinced Rackham that an investment in the company might earn him his reward. In an uncharacteristic gamble that was mocked by some of his business associates, Rackham cobbled together $5,000 (about $120,000 in today’s dollars) and bought 100 shares of Ford’s stock. In 1908, the stock split 20-to-1, and Rackham quit the practice of law in 1913. When Edsel Ford, acting as his father’s agent, bought up all Ford stock in 1919, Rackham’s shares were worth $12.5 million — that’s more than $170 million in today’s dollars. Rackham spent the rest of his life giving away his money. He became a revered supporter of the Detroit intellectual community. His gifts to the University of Michigan began in 1922, and continued until his death in 1933. He financed anthropological expeditions to the Philippines and the Near East, purchased for UM rare collections of Greek antiquities, and sponsored three visiting fellowships in the creative arts, one of which went to Robert Frost. The Rackham Building went up under Mary Rackham’s direction after her husband’s death. It opened in 1941, serving as ESD’s headquarters — our name is on the building in two places — and the home of the UM Extension Service. The Harley, Ellington and Day firm of Detroit designed a classical building with an emphasis simultaneously upon simplicity and beauty. The façade is Georgia marble. Contrasting dark granite was used to stress the windows that are done in bronze with cast bronze ornamentation, including five bronze doors in the center section. Michigan’s most famous sculptor, Marshall Fredericks, sculpted groups of figures representing educators, engineers, scientists, and steelworkers. It’s a Detroit jewel. The ESD wants to make all of it shine again.